Boss Chris Hargreaves says Torquay United do not currently have the budget to offer Durrell Berry a contract. The 22-year-old defender has been training with the Gulls in recent days. He was after failing to agree to a new deal and has been without a club since. When asked if the Gulls had the budget for another player Hargreaves told BBC Sport: "No, we'd have to do some sorting around to make that happen." He continued: "But there's an opportunity for him there to earn himself a contract. "I've got to create that contract for him, but at the moment we're at the first phase, which is coming in and training with us. "Depending on selection it might happen quickly, it might not, but as I say, I can only talk about the first phase of this and that's for him to be at a good club getting fit, and if something works out then great." Berry spent three years at Argyle after and played 107 games, scoring one goal. 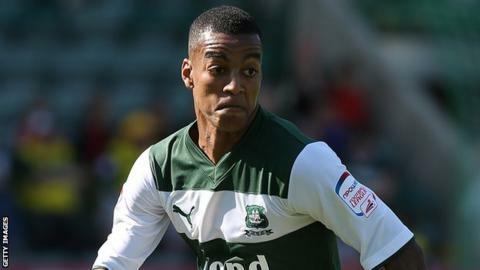 "I think he's a good athlete, a good player, he's a winner and whatever's gone on there (at Argyle) is unfortunate for him as he's now without a club," added Hargreaves. "We obviously have only had him for a couple of days but he's a great competitor and an athlete."